1) She’s looking at DP’s intimidating senior hitters, Carly and Sam Wopat. 2) One of the Wopat twins just slammed the ball off her noggin, and now there are four Wopats, and two of everybody else. Carly and Sam are not the only Chargers who can do serious damage on the volleyball courts. Almost every player has returned from a team that rolled to the CIF final last year. The Chargers lost that championship to the Santa Barbara Dons-whom they had beaten twice in Channel League play-and that assures that DP’s nine seniors will be very motivated in their last go-around. Next year, they will scatter to various colleges. The Wopats have been awarded full scholarships to Stanford University. They are believed to be “polar body” twins-closer to identical than fraternal. “Seventy-five percent of their DNA is identical,” said their mother, Kathy. Both girls stood to inherit exceptional genes, however they were mixed. Kathy, a six-footer who competed in gymnastics and track at UCSB, is a Dos Pueblos math teacher. Ron Wopat, their father, was a powerful decathlete who competed in the Olympic Trials; he is an S.B. City College professor who currently teaches four sessions of calculus at DP. It’s no wonder their girls are straight-A students. They will be helping design robots this year as senior members of the DP Engineering Academy. But she concedes that the girls, who jump and throw for the DP track and field team, have “an extra spark and passion for volleyball.” It started at Kellogg School, where they were coached by Tina Brown, a former Cal Poly volleyball player. Sammie Brown, her daughter, is Carly’s and Sam’s longtime classmate and teammate. All three of them have international experience. In July, the Wopat twins played on the U.S.A. Girls National Team at the FIVB Girls Youth Volleyball World Championship in Thailand. Sammie Brown, a setter, is participating this week in the FIVB Junior Beach World Championship in Blackpool, England. She will return by the time the Dos Pueblos girls enter league play. Santa Barbara High once again looms as a major rival to the Chargers. In fact, the Dons were rated No. 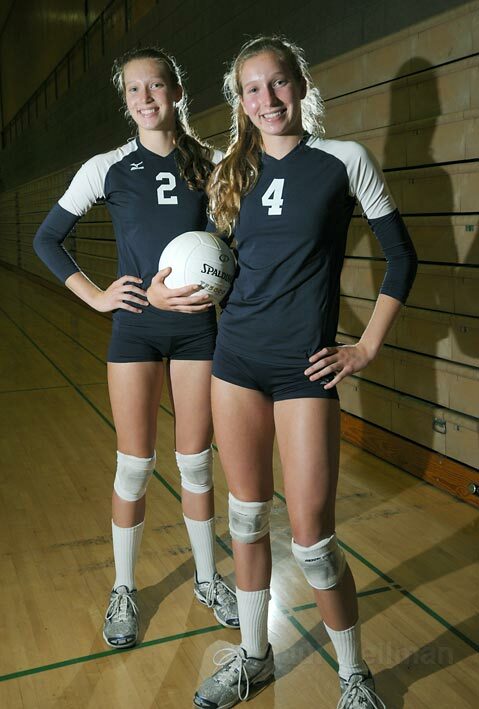 1 on the CIF Division 1-A preseason poll, and DP was No. 2. Led by the stellar defense of Emily Rottman and the hitting of Eve Ettinger, Santa Barbara knocked off the No. 1 Division 1-AA team, Santa Margarita, in four games last weekend. Meanwhile, Dos Pueblos swept Valencia and Harvard-Westlake in a pair of home matches. When the Chargers go up against the Dons this fall, the gyms will be packed with fans and crackling with energy. Their first league match will be September 29 at Dos Pueblos; the rematch on October 27 at Santa Barbara. GAMES OF THE WEEK: Santa Barbara High’s football home opener against Beverly Hills will be tonight (Thu., Sept. 17) at Peabody Stadium, instead of Friday, in deference to the start of Rosh Hashanah. : On Friday night, Dos Pueblos, Carpinteria, and Bishop Diego have home games. : SBCC, which pulled off its biggest football victory in many a year last weekend (17-14 over College of the Canyons), hosts another strong team, Ventura College, at 6 p.m. on Saturday. : UCSB takes on Mexico’s U-17 world champions in an exhibition soccer game at 7 p.m. on Tuesday (Sept. 22) at Harder Stadium.